TVXQ on New York’s Hit Music Station, Z100! The ever-popular Z100 (100.3 FM), which is based in New York City and the nation’s largest radio station, has a special segment on their morning show (Elvis Duran & the Morning Zoo) in which they play short segments of top songs from around the world. Guess who was featured from Japan? None other than TVXQ/DBSK/Tohoshinki and their latest hit, Break Out! And here’s a screencap of it. Another interview of the boys that is somehow related to Valentine’s Day. Again, JaeJoong and Yoochun mentioned their “loneliness” because of them not receiving chocolates for Valentine’s. Seriously, we (fans) should make a last-minute project of collecting funds to buy these two dorks all the kinds and brand of chocolates there is and send it to them this Valentine’s so that the next time they’re asked about their Valentine’s Day memory, they’ll answer “I received A LOT of chocolates from fans”. Good idea? LOL. *Those in  are my own comments. They’re not part of the translated article nor are they the translator’s notes. Recording Industry Association Of Japan – “Break Out” Certified Platinum! These works were released between 1 January 2010 – 31 January 2010. The “Million” recognition also comes with the certification. T/N: This is their first single to be certified Platinum, iirc. SALES UPDATE: 259,773 as of February 2nd. 1. It reached the top spot of Oricon Daily Singles ranking on it’s release day with sales of more than 169K units. 2. This is DBSK’s 7th single to reach the top of the Oricon Charts (both Daily and Weekly) – thus breaking their personal record. 3. They broke the record held by Elton John for more than 12 years as the foreign artist with the most number of sales with almost 256K at the end of the week thus seating them on the top of the Oricon Weekly Singles ranking. 4. DBSK got the top spot for the Oricon Monthly Singles ranking – their very first one since they started their activities in Japan. 5. This single is their VERY FIRST SINGLE to reach PLATINUM in Japan. Ok, as promised here is a much clearer translation of the records that the boys broke with their single “Break Out!”. Korean 5-member group Tohoshinki have made the record as the highest selling artist for foreign artists in the initial sales for singles category. Their 29th single 「BREAK OUT！」was released on 27 January and became first on the 8 February Oricon Singles Ranking Chart. For the initial sales record for foreign artists, up until now, it had been held by Elton John’s “Memorial Song for the former British Princess Diana”, 「Candle In The Wind〜Tribute To Princess Diana, Britain’s Princess」(released September 1997), which sold 184,000 copies. In this area, Tohoshinki broke this record which lasted for 12 years and 4 months, by selling 254,000 copies of their single, becoming the first foreign artist in history to pass the 200,000 mark in initial sales. In addition to becoming first place for foreign artists in initial sales, this will also be Tohoshinki’s 7th work to add on to their list of achievements for getting a #1 single, making this a double achievement for them. Their first single in 2010 is also the theme song for NHK Drama 8’s 『とめはねっ！鈴里高校書道部』. The B-side to this song is the solo number 「XIAHTIC」which was written, composed and arranged by Junsu. 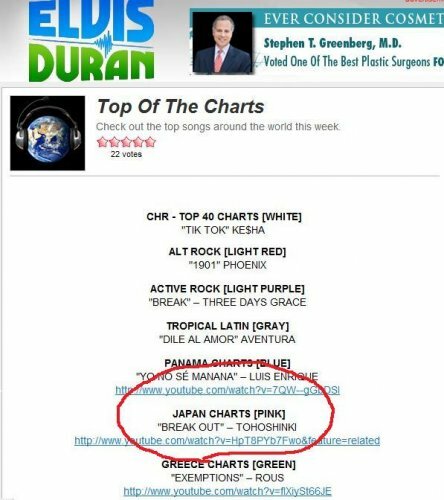 “Break Out!” is #1 on Oricon Weekly Chart and DBSK creates another Oricon Chart record! 1. DBSK’s sales for the single “Break Out!” is the highest (Oricon Chart) weekly sales for a FOREIGN ARTIST in the history of Japan. 2. DBSK broke their personal record as the FOREIGN ARTIST in the history of Japan to get the most number of Oricon Daily Chart #1 for 7 times. And oh, just to remind you, the figure “256,000 units” isn’t final yet. Let’s wait for the final figure from Oricon’s website, alright? But I bet it’s around that number. TVXQ #1 Oricon Single Weekly Chart!! Another History Broken!! #1 Foreign Single Sells In Japanese History! In addition, TVXQ updated the first place for the foreign single sells, by accomplishing their 7 singles to be the top sells in Japanese market. The first place album sells is “Whistle” of HY. 1. TVXQ Won Weekly Single Oricon Chart. Number One Single Sells in Oricon Ranking. 2. TVXQ sold the most single in the foreign artist category in the history of Japan. which updated the foreign artist’s single sells history in Japan.